Serves 4, as a starter or light entrée. Combine the 10 ounces of flour, the eggs, and yolks in the bowl of a stand mixer. Using a dough hook, mix the ingredients on low speed for 30 minutes. After 30 minutes, turn the dough out on to a lightly floured work surface and knead by hand for 5 minutes. Dust the dough with additional flour, wrap with film, and allow it to rest for at least fifteen minutes. The dough can be made up to a day in advance of its use; however, it should be refrigerated if not rolled out within 3 hours. Once it has been refrigerated, it should be brought back to room temperature before it is rolled out. Roll the dough into 2 or 3 sheets, with a rolling pin or a pasta machine. The sheets should be very thin, like card stock. Cut the sheets into ¼ inch ribbons. Dust them with flour and cook immediately or freeze (this recipe makes more than the 8 ounces of noodles called for, and the extra should be wrapped and frozen for future use). Bring a large pot of salted water to a boil. At the same time, heat two large sauté pans, one of them nonstick, over low burners. Cut each asparagus stalk in half. Add one ounce of the butter to the nonstick pan. After the butter has melted add the eggs, sprinkle with salt, and cook slowly until the whites have set. While the eggs cook, add the remaining butter to the other sauté pan. Once it has melted, add the garlic, asparagus, salt, and pepper. Add the pasta to the boiling water. While the pasta cooks, for approximately 2 minutes, gently sauté the asparagus and garlic. Add half the parmesan to the sauté pan, as well as two or three tablespoons of pasta water. 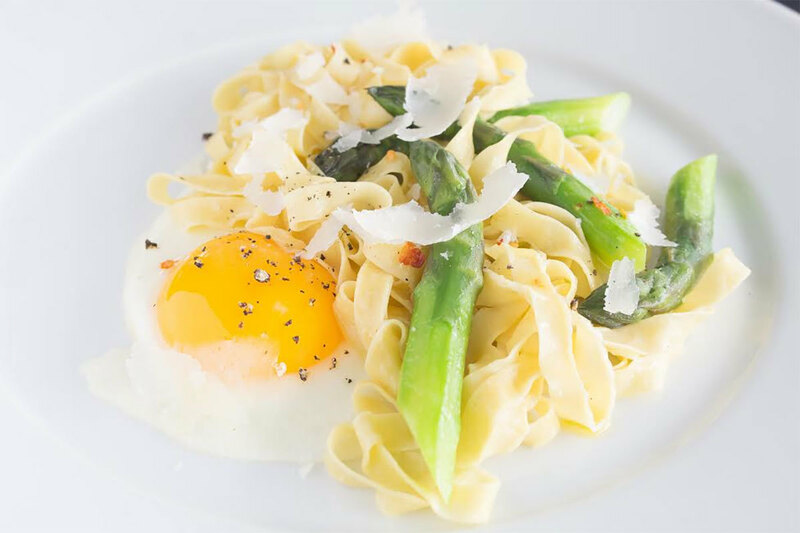 Increase the heat slightly beneath the pan of asparagus and, using tongs, transfer the cooked noodles from the boiling water to the pan of asparagus. Toss the noodles with the cheese, butter, and asparagus. Season them to taste with salt, pepper, chile flakes, and lemon juice. Divide the pasta and asparagus between four warm plates. Top each plate with an egg. Garnish with parmesan and serve.